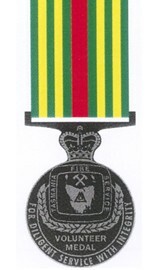 The Australian Fire Service Medal (AFSM). This is the highest award available to fire service personnel in Australia. Tasmania’s recommending authority for this award is the Minister for Health & Public Safety. Tasmania has an allocation of three AFSM’s per year. 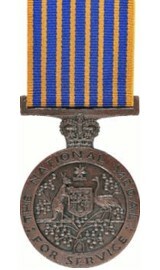 Both of the National Medal and the AFSM, as part of the “Honours System” are worn on the left breast as National Awards. The TFS Volunteer Medal and TFS Volunteer Award. Both of these awards have been established “By the volunteers – for the volunteers”, and with the financial backing of the State Fire Commission for which we are obviously very grateful. Both the Medal & Award have received “State Award Status” having been accepted by the State Government in September 1999 via a Cabinet Submission. The TFS Volunteer Medal & TFS Volunteer Award are worn on the right breast and the lapel badge for the TFS Volunteer Medal is worn on the right lapel of either a jacket or outer garment. This medal is awarded to operational brigade members after initially completing ten years service, as a pre requisite and then it has to be established by a “statement of support” that the service has been both diligent and with integrity”. This is not a “service award” – the Medal is not awarded simply for years of service, although additional clasps for years of diligent service with integrity may be added after the initial approval. 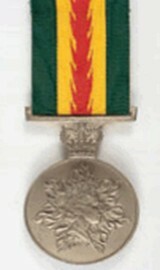 The TFS Volunteer Award is awarded along similar lines to that of the Medal, other than it is awarded for non-operational service. 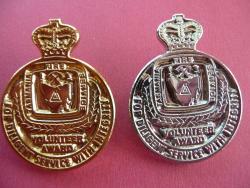 The TFS Volunteer Award is either a nickel chrome or gold lapel badge. A citation is also provided. This award is for non-operational persons of a support role. The TFS Volunteer Medal & Award nominations are reviewed by two committees and awarded if recommended and subsequently approved. Nominations re-open each year on the 1st November and close on the 1st March the next year.